Now, we have to look into the relationship between GDP and Governance and Basic rights as an indicator of quality of life. First, we have to understand governance and then move on to basic rights; then, see what kind of relationship is there between GDP and these two. What is governance? It simply means the act of governing. To govern, there must be somebody to govern and also somebody to be governed. Governing naturally presupposes some goal, some purpose to be achieved. Therefore, in governance, there is someone who governs, there is someone who allows himself to be governed and there is a goal which must be reached through the act of governing. We can say, with these basic facts, that there is governance almost everywhere. For example, a father governs the family members who accept his governance because they have a goal to achieve: family life of happiness to get social recognition. At a higher level, there is the State Government, the Central Government; there are so many bodies with different aims to achieve. For example, there are municipalities, corporations, even business houses, so on. The next question is: what is the relationship you have with such bodies? In other words, it touches the basic point: do you contribute in the decision-making which is the very spirit of governance and how much of your contribution is recognized and accepted by the one who governs. If your contribution is expected and accepted, it means you enjoy a sort of social status; you are somebody to the one who governs. On the other hand, if your contribution is not considered crucial to governance, then, you do not have the same social status as the other one has. That is, recognition in governance is a definite mark of social status. Don�t you know that the MLAs and MPs, leave alone the ministers of government, enjoy some unquestionable social recognition? In a democratic country like India, every citizen is invested with a right to get involved in the government of the country through stipulated framework like election to the municipality, corporation, State Government and the Central Government. And the country has to guarantee the legislative freedom to every citizen. 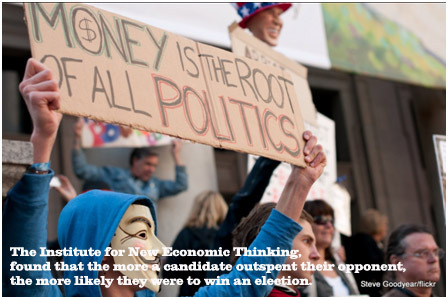 A citizen can participate in public and political life and it largely depends on his attitude and financial strength. To engage oneself in public and political life, one must have to a large extent selfless character; that is, he must be able to spend his time and energy for the benefits of the people primarily. He needs financial strength because entering political life involves participating in regional and national elections to legislative assemblies. We are discussing only the possibilities an individual has for public and political life. These points make it clear that meaningful and consistent participation in political life demands money. And only those who can afford to set aside money for such kind of life, can think of political life. Higher GDP implies more people will be having money for such efforts, though how many will be willing is a different question. A man with huge money may not have interest in politics and, on the other hand, a man with less access to money may have a real passion for such public life. Here, the question is who is the right person to be given the reins of governance and the answer to this question takes us into the very concept of governance which is a very complex one and it falls outside the scope of GDP and its relation to governance. All that matters here is those who have more money will find it easy to seek to come into governance and those who do not have more money cannot possibly think of entering the governance since it means contesting election and winning it. The dynamics of election is a vast field of study with which we are not concerned here at the present. Because, when governance is discussed, it leads to the next inevitable question: What is good governance? Here politics and ethics mingle into one another making the field more and more complex with so many threats to fair governance like corruption, criminalization of politics and generation of black money etc. Higher GDP in effect points to the fact that more and more of people will have potentials to enter politics with their money and lower GDP means people will not have more disposable money for political engagement. Having said about the basics in governance and its relationship with GDP, we shall move on to another indicator of quality of life in relation to GDP.